The Archbishop of Bangalore, Most Rev. Lourduswamy, gave the Pallottines his formal permission to open the novitiate house in Bangalore on December 9, 1967. He also entrusted the Pallottines with the care of the German-speaking Catholics in the area and the Catholics in the nearby villages. 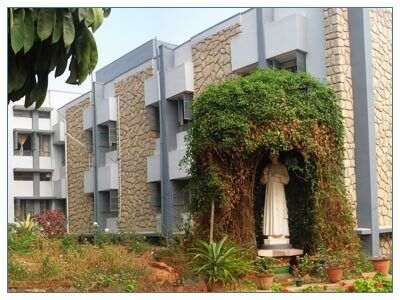 The foundation stone of the novitiate was laid on April 19, 1972 by then Archbishop of Bangalore Most Rev. Packiam Arokiaswamy, who after the completion of the construction blessed and inaugurated it on June 2, 1973. The house was named Pallotti Nilaya. Fr. Otto Harle, SAC, and Fr. Anton Nenzl, SAC, took charge as the Novice Master and as the Spiritual Director respectively. Nineteen novices received the habit of the Society and began their novitiate on June 02, 1973. On May 31, 1974, 14 clerical novices made their first profession and proceeded to Pallotti Bhawan, Nagpur to pursue their theological studies. The house continued to be the centre of the spiritual formation of the Pallottine candidates in India over the years under the able guidance of its novice masters Fr, Otto Harle, SAC, (1973 - 1976), Fr. Joseph Tharakunnel, SAC, (1976-1981) Fr. Aloysius M., SAC, (1981-1987), Fr. Anton Nenzl, SAC, (1987-1993), Fr. Jacob Nampudakam, SAC, (1993-1999) Fr. Mathew Thonickal, SAC, (from 1999 - 2003), Fr. Alex Crasta, SAC (2003-2006) Fr. Charles Fernandes, SAC, (2006- 2011) and Fr. Claudy Vaz SAC (2011- ). From June 2010 the Novitiate is shifted to Chandor in Goa.